I’ve been watching a lot of Star Trek lately. Some of the Original and Animate episodes, plus everything that aired from 1987 through 2005. I wanted to refresh my memory on old episodes, and fill in gaps for the later ones. This gives me a lot of RPG ideas for future posts. 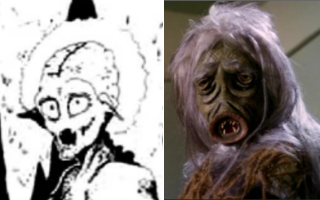 But one thing I noticed while watching the TOS episode “The Man Trap” were similarities of the Salt Vampire to the Doppleganger illustration in the AD&D 1e Monster Manual. They aren’t exact, but both creatures have a slightly withered or ancient look, circular mouths, and large, soulful eyes. And, of course, both are shapeshifters. Aside from believing the Star Trek monster may have influenced the 1e illustration, it makes me think maybe dopplegangers should be salt vampires, or at least this could be a partial motivation for their invasion of civilized lands.